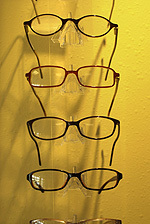 Our optical boutique in East Orlando offers a large selection of eyeglasses, contact lenses and designer frames and sunglasses. We carry the latest European and American designer eyewear collections in a variety of styles, colors and materials including titanium, stainless steel and plastic. We offer smart blue filter lenses to treat computer vision strain. Our lenses are 100% digitally designed, featuring the latest Essilor products including Verilux, premium progressive lenses, and wave technology.